Researchers from NASA and Johns Hopkins University’s Applied Physics Laboratory found that meteoroid strikes could pull water from the moon‘s surface, which then turns into vapor. 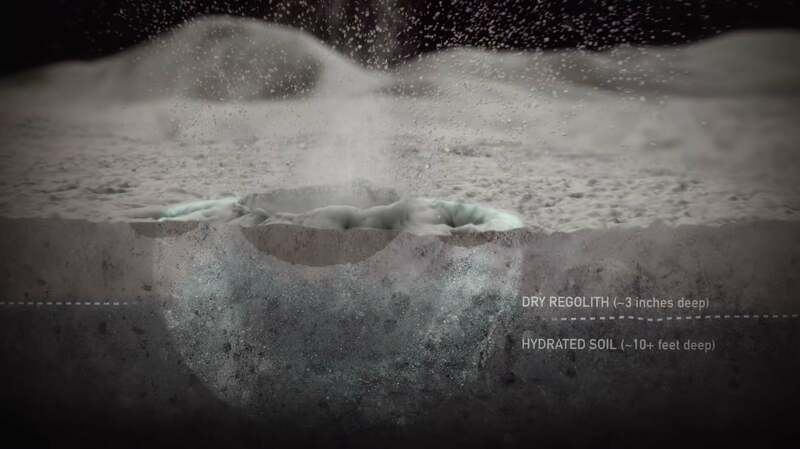 The research also sheds light on the possible history of lunar water, which could greatly contribute to future lunar missions by providing liquid, oxygen resources and rocket fuel made from hydrogen. While previous models predicted that meteoroid strikes could draw water from the moon’s surface, the phenomenon hadn’t been observed until recently. The team observed several events in data gathered by NASA’s Lunar Atmosphere and Dust Environment Explorer LADEE. The mission orbited the moon and gathered valuable information about its structure and the composition of the nearly-nonexistent lunar atmosphere. “We traced most of these events to known meteoroid streams, but the really surprising part is that we also found evidence of four meteoroid streams that were previously undiscovered,” lead author Mehdi Benna of NASA’s Goddard Space Flight Center said in a statement. The study’s results were published in Nature Geoscience. The meteoroid strikes that caused this phenomenon to occur were captured by LADEE on Jan. 9, Apr. 2, Apr. 5 and Apr. 9, 2014. Researchers already knew there was H20 and its hydroxyl (OH,) which is a more reactive version of water. However, researchers continue to dig into how the water came to the moon and how much there is. LADEE detected the water vapor on the moon using its Neutral Mass Spectrometer, an instrument built by the Goddard Space Flight Center. The mission around the moon took place between October 2013 and April 2014, and it helped scientists learn more about the moon’s properties and the composition of its tiny atmosphere, also known as the “exosphere,” which is a tiny layer of gases surrounding it. Using measurements of the water vapor in the exosphere, researchers found that the hydrated layer of the moon just underneath the top layer consists of 200 to 500 parts per million of water. That’s drier than the driest soil on Earth, but it’s also consistent with findings from earlier studies. However, researchers believe all the water they detected didn’t come from the meteoroids themselves. “We know that some of the water must be coming from the Moon, because the mass of water being released is greater than the water mass within the meteoroids coming in,” said author Dana Hurley of the Johns Hopkins University Applied Physics Laboratory. “The water being lost is likely ancient, either dating back to the formation of the Moon or deposited early in its history,” Benna said.